Do you need some stylish inspiration for the 4th of July? We all know that getting dressed for a holiday event can be so stressful. Maybe you are going to a BBQ, spending the day at the beach or heading to an evening party. Selecting the right outfit for the occasion is very important. But like any holiday, you want to look festive, but done tasteful without looking like you are wearing a costume. Which of the looks is your favorite look for 4th of July? I love relaxed jeans and a simple white tee but the looks above are all fantastic. I love the romper the best. 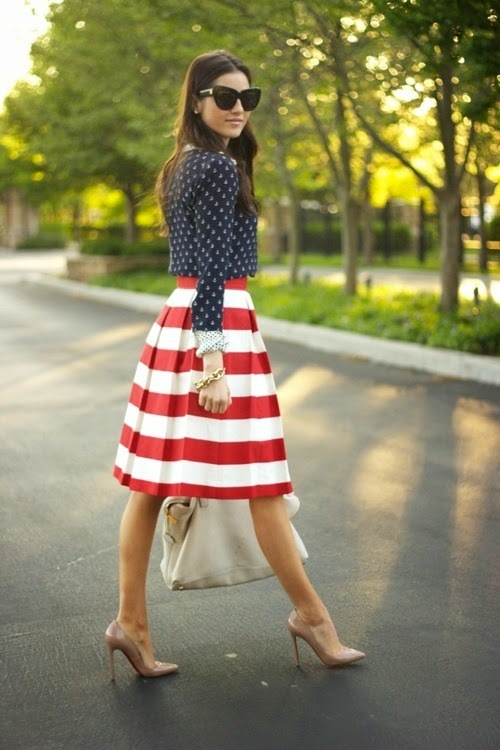 I haven't decided what I'm going to wear yet on the 4th but all of these styles are great! Helps gives me an idea. I'm going with the denim shorts look that's almost like the one you featured. It's gonna be hot and muggy. Happy 4th!! All the looks are awesome. I need to do some DIY on my shorts! I love those cut up shorts with the button up. Yes @Reginia Cordell jeans and a white tee is super comfy! You know I love rompers too. @Dionne Dean any luck finding seersucker? @Louida M awesome. I am glad you were inspired. @Alli Smith I hope you had a great 4th too! Yes I need to DIY some of those shorts too. I have to find the perfect pair while thrifting. I did! I found both a skirt AND shorts at the Thrift outlet! Now I need to decide what to pair them with. I don't want to do the traditional red or white blouse.